It is an introduction to the main text of a book written by the author which typically stats the scope, subject and explains its purpose. Writing a preface will be easy only after writing book and it is front matter that can be short or long as per your convenience. It is a place where you have to be honest and clear to your readers regarding the writing of the book, either it might be a biography or a fictional story. You have to create interest in the book with it so that readers will show some interest in the author and also about the work created by them. By this reader are automatically drawn to the preface. Who inspired you writing this? The preface is about describing what the context of the project is, all in general lines. You need to tell the readers what is the main idea behind the project work. While describing make sure you do not reveal too much about the project. Leave some room for the mystery, so that the reader finds the mystery by going through the whole project inside. The preface should be written in the manner you are writing an introduction, but by keeping in mind that the intro does not give the clear picture of the whole project. The project should be written in a short and precise manner so as just to give a gist of what is there inside the project. In this part you can explain the reasons why you chose a particular topic. What was the main idea behind and which factors forced you to take a complicated task, must be explained as it intrigues the readers and also arouse interest to go through the whole project. Whatever the project is, just make sure you give a good and real description of everything. The reason why you chose a topic should be explained in a detailed manner. The main reason and the purpose behind the making of the project must be described clearly in the task you took to complete. You need to explain in the preface about the benefits the readers can get after going through the project. Also, you can write what is different from the project than other projects. Only something different will make the readers go through the whole project but before that, one will read from the preface. The preface must have one paragraph in which you explain about the target audience, the project is meant for. What kind of people you had in your mind while making the project, what queries you had in the mind while you prepared for such a project, must be given in the preface. Also to make preface more appealing, you can add few questions you had related to the project and also related to people you are targeting for the project. The reasons like whether you were familiar with the topic, or you were interested in the topic, you longed to work on such project for very long or something like it was close to your heart due to domestic reasons etc. can be detailed in the project. Such things bring readers closer towards the project and certainly they make an effort to experience the project through the reading. So, it is essential to pen down the reasons you did the particular project. What kind of help, you took to complete the project? Like the resources you made use of or the books you referred, the technologies you made use, websites, articles, blogs you read for completing the project must be mentioned. What was your inspiration for doing such a project can also be mentioned in the preface. The source of your information needs to be told to the readers as the readers like to know all such things before they move ahead with reading of the project; say it to be a book or any article, etc. It interest readers know the inspiration, the sources, the struggle you made to accomplish the project. How long you took to make the project can also be written down in the project. Also the reason why you took so long should be explained. Whether you took more time in research work or you were busy in some other work while doing the project can be mentioned in the record. This should be mentioned in a different paragraph. Do not mingle it with other paragraphs or don’t just give one liner for it. What you felt while doing the project, how this project helped in your knowledge, talk about what you have learned while you worked on the project. How it helped you as a human being and how the project will help the readers if they will go through the project work. Writing the feeling in the preface is something that adds a personal feeling with the work. When the readers will read the preface, it will look quite interesting as more of personalized experience is explained that lures most of the readers. What problems you faced while doing the project should also be mentioned along with the advice that should be given to the readers on what points they should keep in mind if they do something akin to this project. Tell them the limitations of the resources you used and also give guidelines on how to take care while doing the project work. In the preface, pen down all the incidents you had gone through, along with the experiences you got. This makes the preface full of life and the readers will be interested to have a look into the project work. You need to acknowledge all those who worked on the project. This is called attributing the sources, the people who helped you in the whole process. Expressing gratitude while you write the preface is something which help people encourage and also it is included in the virtues needed for an individual. Not just this, it also lets people learn the value of the team work. When you write the preface write in the paragraphs. Each paragraph should be different and should have something different. Do not write in an essay type format or it will make the preface look very dull and monotonous. So, write in short paragraphs. Do not repeat anything and write clearly. When you write the preface, make sure you do not scribble while writing. Scribbling will only reduce the effectiveness of the preface and can give you assurance of reduced readability. Do not write long and complex sentences. The sentences you write should finish in one breath and should not be complex or compound in nature. The short sentences should say all as the complex and the compound sentences only creates confusion in the mind of the readers. The initial page if will have a number of errors, then the value of the project will reduce to a larger extent as the first page puts the first impression and if the initial impression is not good, certainly there will not be any chances of moving ahead in the project by the reader. So there must be no grammatical errors, no repetition of the words, no spelling mistakes, especially when you write the names of the people who contributed their efforts in completing the project. Get the Free & Quick Proofreading tool by Grammarly! Instantly proofread your texts and correct grammar and punctuation. Which organization are you working for to make the project must also be mentioned in the preface. Write about the company or the organization in your project. You need to justify the efforts of everyone, every organization, even if the readers are not interested in reading about the company. You can talk all when did your company started, what goals it has achieved, what more are about to come and also why the company chose such a project to put forward to the viewers or the readers. Follow the steps while you write the preface. For example, first say about the company, initiating it with the name of the company, then its goals, the criteria it followed, then about yourself, why you selected such a topic to work on, then the efforts you made, all what you learned while making the project, thanking everyone who assisted you, and everything that you would like to share with the readers and the viewers of the project. Maybe something hidden is there that you want the public to know at large scale, the preface is the right platform. You may have gathered a different and external information while making the project. It is advisable to write down that too in the preface. One paragraph for the external information can add charm and glam to the preface as well as the project work. The modules mean the parts in which your project is divided. Your project may be divided into different parts and if it really is, then mention it in the preface. If you wish, also tell why you divided the project into the modules or the parts. What you thought while doing the same and from where did you get the inspiration to work by dividing the content for the project. You need not write essays while you write a preface. Just take care of the length and the word limit. The professional work is always sophisticated and looks royal, so you need to do the same to make the project look professional. Apparently for that you need to see the length and also the word limit. The words should neither to be too simple not be too technical, but soft words can do wonders. So, make sure you keep in mind the type of words you use while doing the project and especially writing the preface for the project. Here the pictures are not of the celebrities, but of those people who contributed to the project. Along with their pictures, you can write down the designation, their achievements in brief while thanking them for their dedicated efforts. Although the preface is all in written and makes the thing little boring, but the pictures can add some tint of interest in it, luring readers like magnet towards the project. Also, you can get the signatures of those people down the picture. Making use of the pictures, the signatures and the designation, gives a professional touch to the work and indeed it is good to create impressions in the mind of the public. 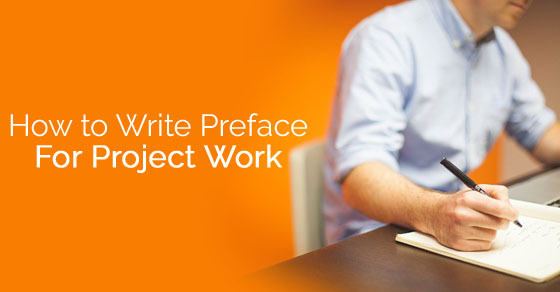 The above are some of the points that one must keep in mind while writing the preface of the project work. You need to work in a professional manner and if you are willing to put your best into the project, then certainly you will want to initiate the project with the professional attitude only. The preface is something which can decide whether the reader is interested in the project or no; like if the preface is not saying anything, maybe the reader drops the idea for further reading of the project.